“Chocolate cream”, was a common breakfast drink at Mount Vernon for George Washington and his guests. It was made with grated chocolate mixed with heated water or milk, sugar and sometimes with brandy or wine. This drink had a thick consistency similar to a syllabub or eggnog. Enjoy the authentic taste of American Heritage Chocolate in your favorite recipes. Chopped, shaved, chunked or melted, this chocolate gives a unique flavor to your recipes. This all-natural, preservative free product is fashioned from an 18th century recipe using cinnamon, nutmeg and red pepper. 1. In the top of a double boiler, heat the water until very warm. Gradually add the chocolate, stirring constantly until warm. Gradually add the chocolate, stirring constantly until melted. Blend in the sugar, and continue to stir until thoroughly dissolved. Add 1 cup of the cream, and continue to heat, stirring to blend. Stir in additional sugar, if desired. 3. 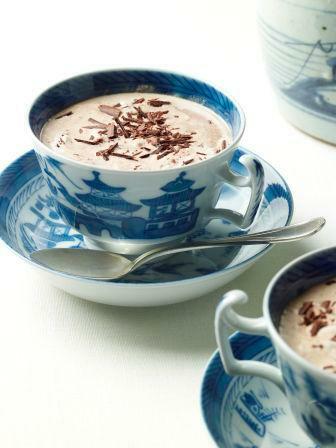 Use a chocolate mill, whisk or immersion blender to froth the chocolate cream. Pour into a posset or demitasse cups, and spoon the froth on top.